One of the things that make a wedding memorable is the food served on the big day. 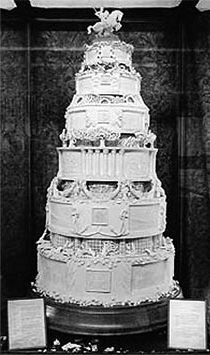 Moreover, the splendiferousness of the wedding cake . No doubt, the royal wedding will be afforded the best cake(s) possible. Celebrity cake makers (and there are quite a few of them) up and down the UK are sitting on the edge of their seats, waiting for the call. Were I one of them, I'd make the cake for free, as this prestigious undertaking alone would be the making of my career now, and throughout history. Let's take a look at what Prince William and Kate Middleton's wedding cake could look like, based on past Royal samples. Each cake baker and decorator have got their own view on what makes the best possible presentation when it comes to royal wedding cakes. Martha Stewart's Wedding Cakes (book on left) proves that one person could have several views on getting to the same finished product. Part of Princess Diana's and Prince Charles' wedding cake was kept for years and sold at an auction. Maybe the one baked in April 2011 will also live a long and 'healthy' life. Well-known British baker, Fiona Cairns, was chosen to design and make the cake for Prince William and Catherine's wedding cake. In case you're wondering, it's a traditional British fruitcake with cream and white piping. Yum! Here are some more about Royal weddings you may like to read: What's your favourite royal wedding cake so far? There are so many to choose from.